For the Sunshine State food tour enthusiast, this statement couldn’t be truer. From Vietnam to Cuba, world food culture converges in Florida. The whole history of the Sunshine State can be best experienced by biting into some of the state’s most delicious dishes. Like most places that receives cultural transplants from other places, Florida is a place where ethnic food influences and is influenced by the cultures that make up this place. Case in point: The Cuban Sandwich. What Exactly is a Cuban Sandwich? On the surface of it, the Cuban Sandwich, or the Cubano, is the Cuban variation of that classic comfort food, the grilled ham and cheese sandwich. But it definitely has a twist, making this old standby something refreshingly Floridian and favorite among those who love RV travel in the state. Here’s how it differs from the classic ham and cheese sandwich: It’s made with Cuban bread, which is a white bread similar to Italian or French bread. It definitely still has the ham, but it also gets a generous portion of sliced roasted pork. And instead of having American or cheddar cheese, it comes with Swiss most of the time. Some sandwich-makers also add sliced dill pickles to the sandwich as well. Where Can I Find the Cubano on my Sunshine State Food Tour? If RV travel to America’s sunny Southeast is in your future, you’ll want to make a note to stop in the following places to find a Cuban Sandwich. Each place further adds its own twist to the Cubano, some of them significantly and deliciously so. Tampa counts among the best places to try a Cuban sandwich, in part due to the fact that the city calls the Cuban its sandwich. Tampa restaurants also add salami to their Cubano sandwiches, making this version of the sandwich a delish, spicy alternative to the sandwich. The Cuban Sandwich Shop: Aside from serving this famous sandwich, you can get a delish Greek salad, hot soups, and steak and onions. La Teresita Restaurant: Menu items also include roast pork, fish mariners, and pot roast. Gaspar’s Grotto: This eatery combines two regional favorites – pirate culture and the Cubano. It’s hard to beat! Versailles Restaurant: This eatery has become a fixture of Cuban cuisine in Miami – (forty years and counting). Stop in to get some cod fish fritters or plantain soup. And of course, the Cubano. Enriqueta’s Sandwich Shop: Here’s another place in Miami that adds a bit more culture to its Cubano. You get the usual stuff – the ham, the cheese, the pickles – but you also get a few croquetas inside. It’s a fun way to experience this food staple. Havana: This West Palm roadside cantina boasts fans like Martha Stewart, Bonnie Raitt, and Eric Clapton to name but a few. It’s the kind of place that’s perfect for those who live the RV touring lifestyle. It’s a walk-up window cantina that serves some of the best Cuban sandwiches around. It’s also a place to grab an early morning coffee or pastelito before you hit the road. 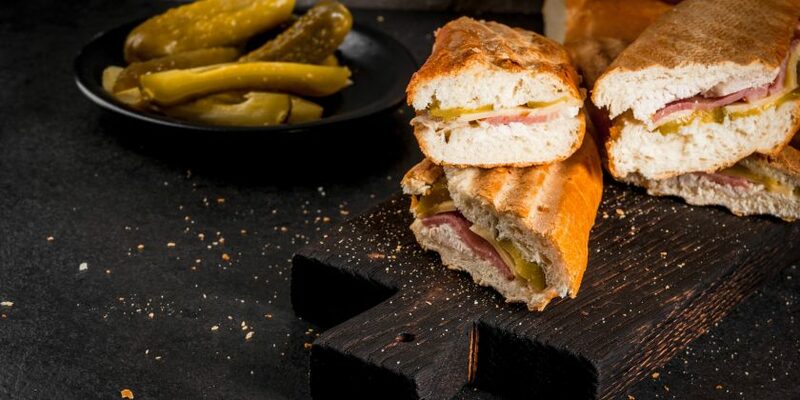 The Sunshine State is known for many great ethnic dishes, including the Cuban Sandwich, a delish alternative to the good old ham and cheese sandwich. While it’s possible to get a yummy Cuban sandwich in many places in the state, the seven restaurants highlighted in this post are especially known for making a great ham and cheese with a Cuban twist.